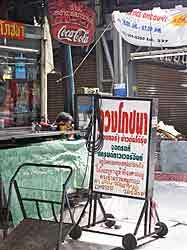 On Sukhumvit Road, just before Soi 55 (Thong Lo, pronounced Tawng Law) there is a very Thai option for getting your watch repaired – a street vendor. 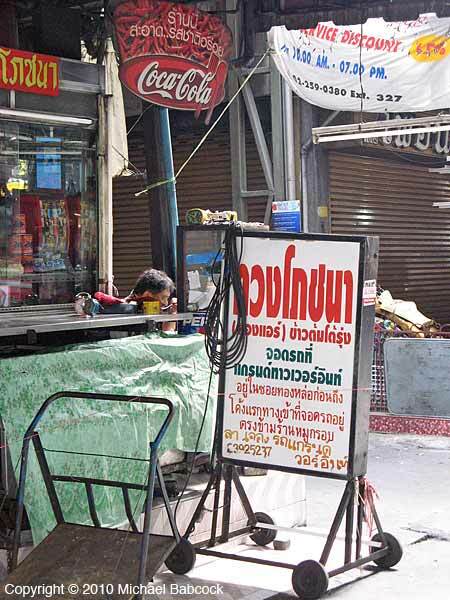 This is one of the nice things about Thailand: you can find entrepreneurs of all types on the street, including tailors who set up with a sewing machine right on the street, and shoe repair. 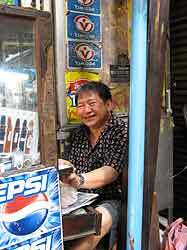 Last year I had the soles of $180 pair of shoes repaired for about $10.00 – a real bargain. I don’t know the name of this watch repairman. 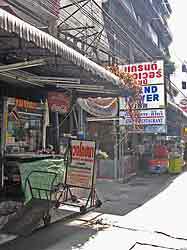 He has been in the same location since I’ve been coming to Thailand beginning in the fall of 1992. If you’re not looking for him, you might miss him, nestled as he is in a little niche among the storefronts and street vendors. I’m including a number of different photos of the street to give you an idea of where to find him. 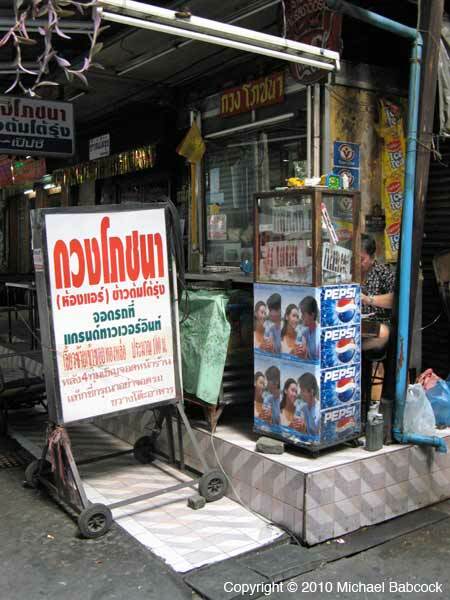 The picture below (to the left) is perhaps the most useful: look for him right by the sign for the Grand Tower Inn. 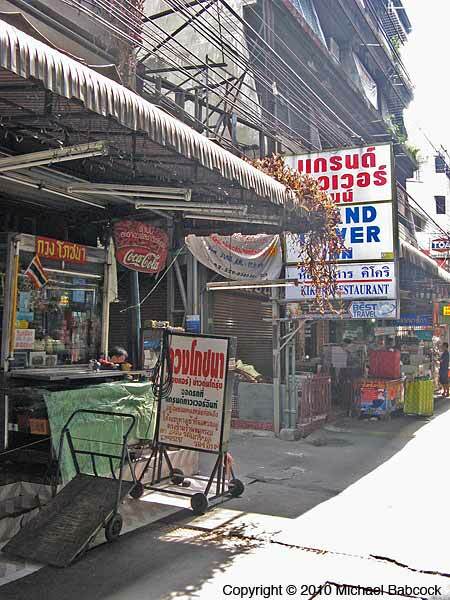 He’s actually situated right by a little alleyway (in between Sukhumvit Sois 53 & 55) that leads to the Grand Tower. 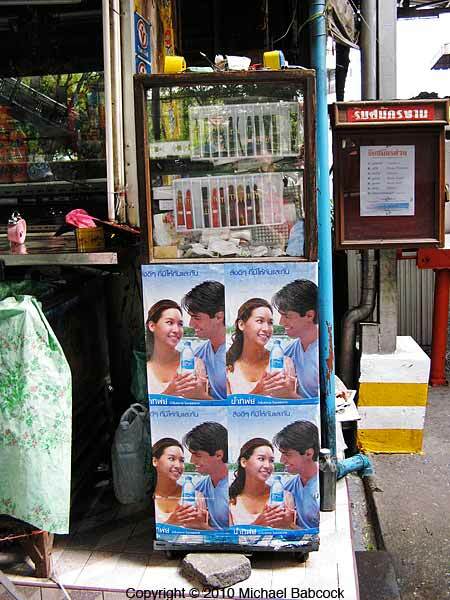 Can you see the vendor? Over the years, we’ve had a number of repairs done by him including several watchbands replaced, new batteries and stopped watches repaired. For simple things, he’ll do the repair right on the spot as you wait. For repairing the workings of the watch, you leave the watch and return in a few hours. One of the main advantages of street-side repair of any kind is the cost. I don’t remember specific baht prices of our watch repairs, but I can recall being pleased with how inexpensive they were. Batteries, for instance, cost a fraction of what I’d pay for them back in Oakland, California. Without the overhead of the storefront he can keep costs down; I suspect that he does pay some kind of a rental fee to someone, probably the store he is directly in front of. 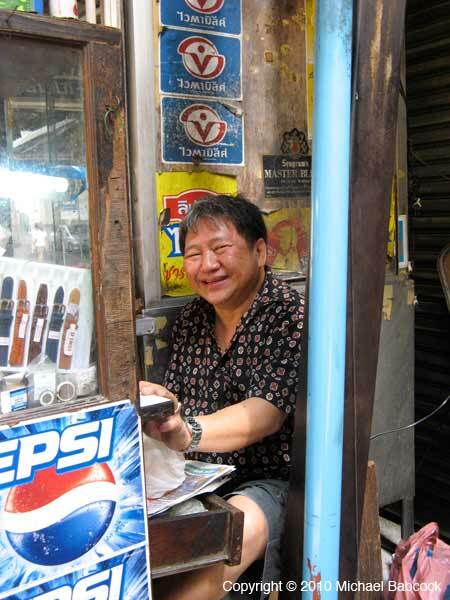 This is another reason I love Thailand: although much of Thailand is sophisticated and modern, you can still find these sorts of vendors eeking out a living on the street. It makes for a lively, exciting place to be. Snorkel Thailand Now, Before the Reefs are Gone! 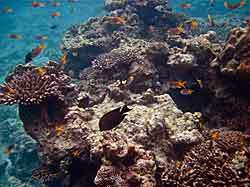 Global warming has taken its toll on the world’s tropical reefs, Thailand included. 2010 saw one of the most serious coral bleaching events in recorded history affecting most of the reefs in the tropical regions of the world, from the Indian Ocean and the South Pacific to the Caribbean. 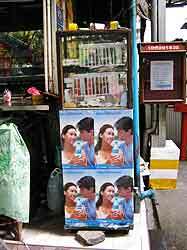 A few months later, after i had returned to California, I was worried when I read in the Bangkok Post online newspaper that marine scientists were very concerned about the rise in sea temperatures that was causing massive coral bleaching. 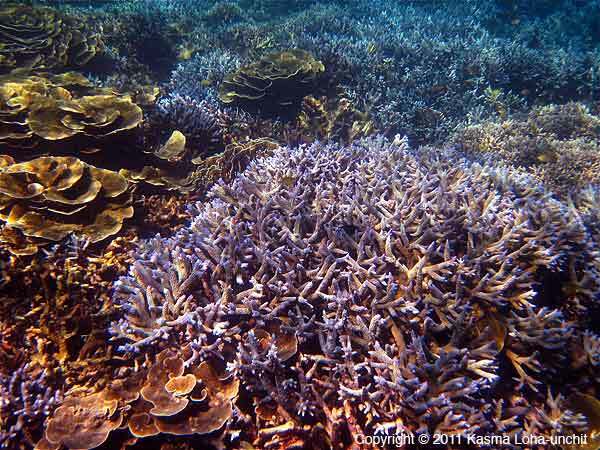 (One article is Andaman Sea coral reefs hit by bleaching”.) Many were keeping their fingers crossed that the high sea temperatures wouldn’t be prolonged so that the coral could have a chance to recover. 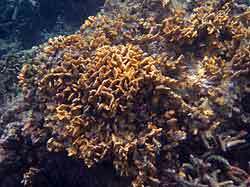 The colors of corals come from a kind of microscopic algae that live inside them. 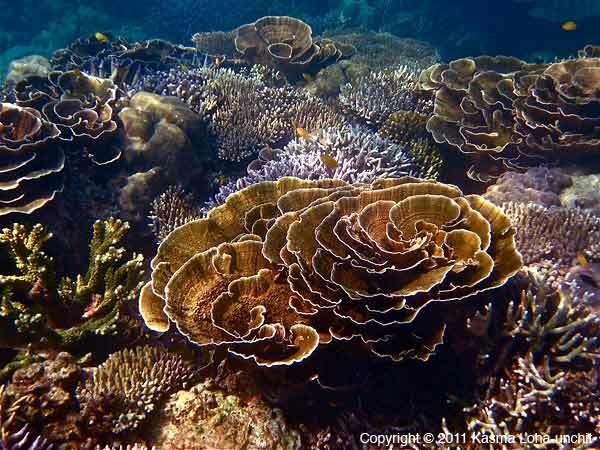 The corals form a symbiotic relationship with the algae which nourish them with the essential nutrients they cannot produce without the algae’s ability to photosynthesize energy from sunlight. 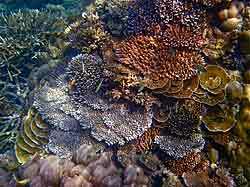 Bleached corals are still alive. 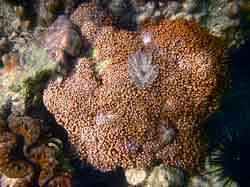 If environmental conditions improve within a reasonable period of time, the algae can return to normal and become reabsorbed by the corals. 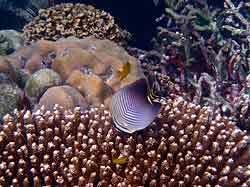 However, if the environmental stresses are prolonged, the algae can die and when this happens, the corals, without their partner to provide them with the food they need, will eventually starve to death. 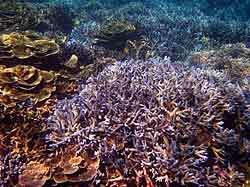 Coral bleaching events, therefore, are closely monitored to ascertain the degree of recovery and destruction of the reefs. Scientists concur that the bleaching was caused by significantly higher than average sea temperatures from an El Nino cycle made worse by global warming which had already raised sea temperatures. Bleaching episodes occur when ocean temperatures rise above 85 to 87 degrees F. In 2010, ocean temperatures as high as 93 degrees were reported in the Indian Ocean and around the Coral Triangle. Scientists believe the devastating event in 2010 might be even more severe than the last massive bleaching during the 1998 El Nino, which destroyed more than 16 percent of the earth’s reefs, most of them in tropical regions. Some of the reefs damaged by the last event were just beginning to show some recovery when this recent bleaching put them back in jeopardy. It usually takes a decade or more for a damaged reef to make some measure of recovery if conditions return to normal and stay ideal for the corals. 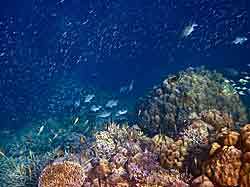 However, with no signs of global warming slowing down and short of any concerted international effort to drastically reduce CO2 emissions any time soon, tropical reefs are endangered and, according to some scientists, it’s likely they might become extinct within the next two decades. 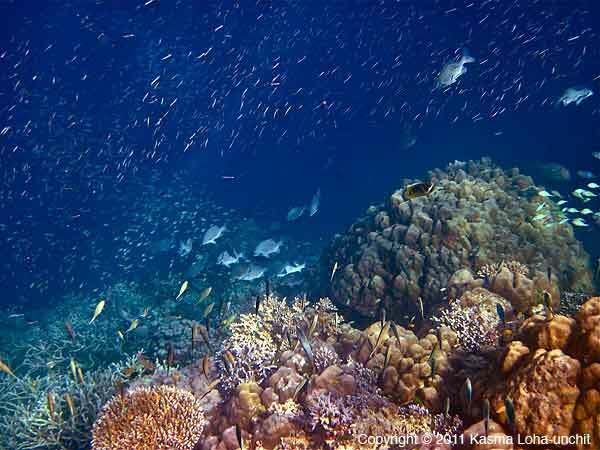 By January of this year, ministries in the Thai government (as well as in several other neighboring countries) announced the temporary closure of a long string of the country’s most precious dive sites in hopes of rehabilitating the reefs. It became apparent that the coral bleaching event during the hottest months of the year from April to June 2010 had led to the widespread demise of some of Thailand’s most beautiful and highly prized reefs. My heart sank as one of my greatest joys of coming home to Thailand every year is to immerse myself in the warm waters of the seacoast and in awe of nature’s beauty beneath the surface. I just had to see for myself how bad the situation really was. My husband Michael and I took a trip down to the Andaman seacoast in late January and checked out the reefs in our favorite marine national park — Mu Koh Surin Marine National Park, followed by a few days on the islands off the Krabi coastline. That trip showed us in no uncertain terms the destructive face of the specter of global warming. Upon my return to the States in March, I wrote an email reporting what we saw to a few of the people who had expressed interest in joining my next southern Thailand trip (in Jan/Feb 2012) to relive their treasured experience of Thailand’s southern reefs.
. . . Thailand did not escape the 2010 global coral bleaching episode, but although a considerable amount of damage had been done to our favorite reefs, from Koh Surin to Krabi to Tarutao, we are planning to go ahead with our southern trip scheduled for next January/February. From our point of view, at our age, we most likely cannot expect to see a perfectly healthy reef again in our lifetime as the recovery process is slow and sea conditions cannot be expected to remain ideal for the reefs with global warming still uncontrolled. We fear that this recent global coral bleaching disaster may mark the beginning of the end of tropical coral reefs, as some scientists believe. 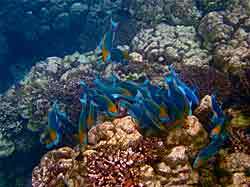 We, therefore, would want to take every opportunity to go snorkeling before the tropical reef system is further damaged in the next major El Nino cycle. In many badly damaged reefs in Thailand, conservationists are beginning to observe small signs of recovery since the bleaching occurred last April and May, and have pushed for measures to reduce other sources of environmental stress on the surviving corals to improve their chances of long-term survival and ability to reseed the reefs. 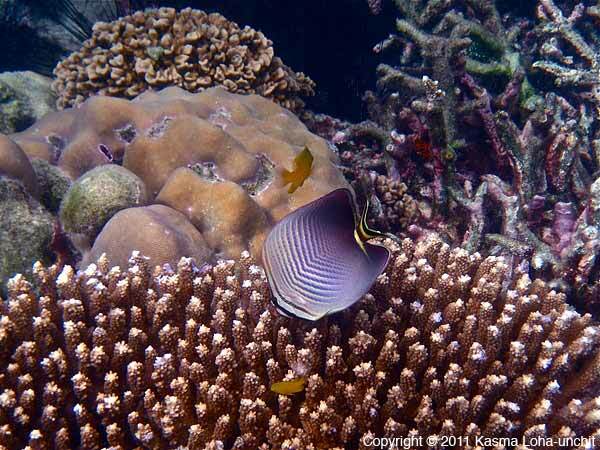 Michael and I took a week’s trip recently to check out the reefs on Koh Surin National Park and around the Krabi area. We had wanted to check out our favorite spots at Phi Phi but a major storm system moved in that week and thwarted our plans. (It is presently the La Nina part of the cycle marked by stormy seas.) Instead we ended up on Koh Poda and snorkeled the nearby islands. The longtail boat driver we hired took us to a reef we hadn’t snorkeled for some fifteen years. 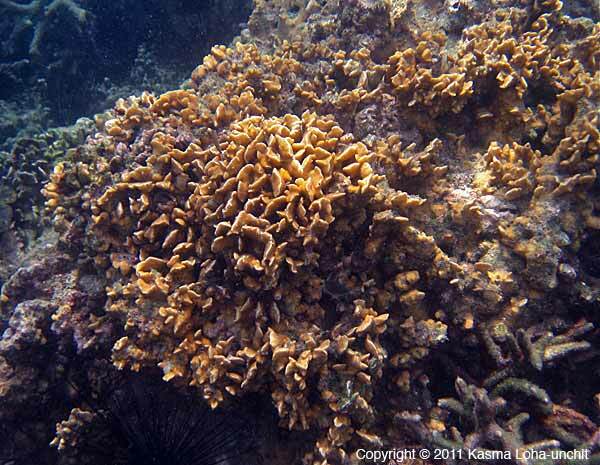 We were heartened to see new coral growth after the overused reef was closed off more than a decade ago to tourists. Trip A had a day trip to Phi Phi in December but on the day we went, we were able to snorkel only one site before the seas turned too rough to swim. But that hour snorkeling Koh Yoong was nothing short of magical as the tide was perfect and there were tons of fish. 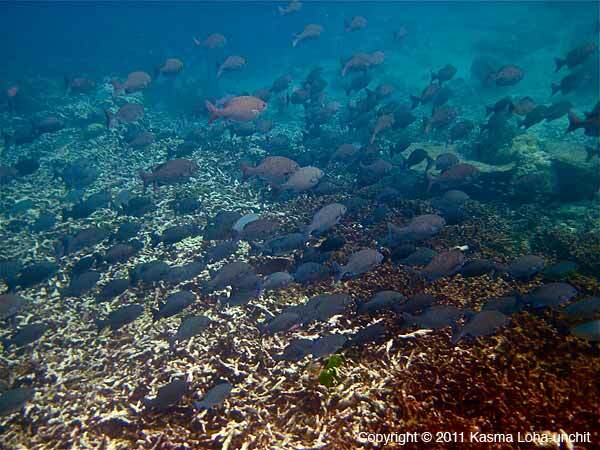 I was not yet fully aware of the extent of the coral bleaching at that time and was too distracted by the abundance of fish to pay much attention to the condition of the corals. In fact, I even snapped some photos of beautiful corals apparently unaffected by the bleaching event. We were at Koh Surin National Park for three days. Although we were saddened to see large expanses of dead coral, we had a wonderful time nonetheless snorkeling the different sites. There were plenty of colorful fishes to keep us entertained and we honestly hadn’t seen as many enormous schools of different kinds of fishes since the tsunami year. As we do every year, we saw varieties of fish we’d never seen before. The damaged reefs continue to provide structure, form and color as a backdrop and as homes and breeding grounds to the reef fishes. The seaweed and algae that have begun to cover the dead corals are a source of abundant food for the herbivores, including the turtles. We saw lots of reef sharks which meant there’s still plenty of food for the larger predators as well. 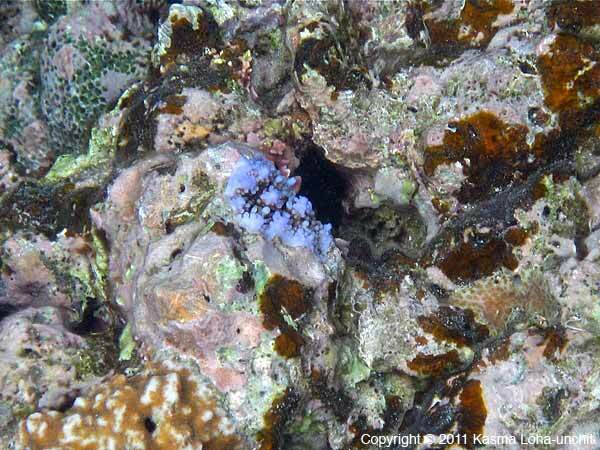 The occasional sighting of swaths of living coral and the brilliant colors of tiny new coral growth made me smile with excitement as I photo-documented what I saw. 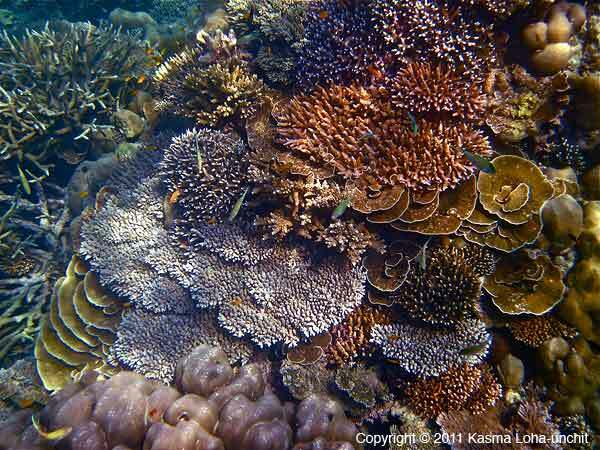 There are some varieties of coral more resistant to bleaching than others, so there’s still plenty of color on the reefs. Although some of our favorite reefs are temporarily closed to allow them to recover more quickly (and we agree with the park’s decision), I was glad to get to see reefs we had overlooked before. In certain ways, they are every bit as interesting. I am a little more hopeful after hearing a few people I know on Koh Surin National Park report recently that there are ample signs of new coral growth in several locations around the islands. At the same time, I hear that another El Nino is coming in a few years. 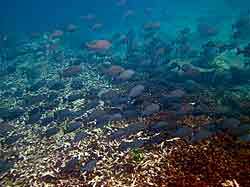 With all the uncertainly surrounding the survival of the tropical reefs, all I can say is: I am going to put on my snorkeling mask and go snorkeling as often as I can before the reefs forever disappear. And unless we all do something to slow, if not stop, global warming, it will be sooner than later. 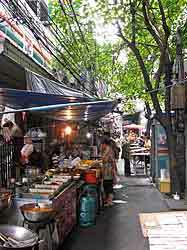 You are currently browsing the Thai Food and Travel Blog blog archives for December, 2011.